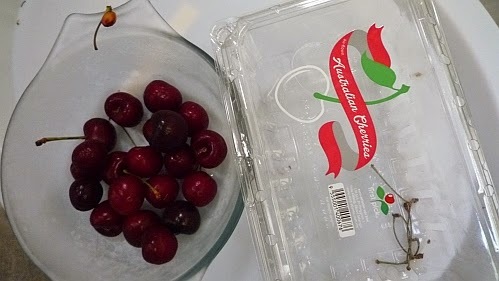 I don't usually buy cherries because they are expensive. Then I figure instead of spending a huge amount of money eating lots of sinful food during this festive season, why don't I buy some cherries. So I bought a packet of 500gm of cherries at a discounted price of MYR24.90 (normal price is MYR29.90). I am aware that some night markets sell cherries at a cheaper price but I seldom go to night markets. I can just continue popping them into my mouth non stop. What is your favourite fruit that you can't stop eating once you start? I prefer langsat to grapes cos the latter is more expensive. Bananas...and papayas for me, so kampung. No cherries for me - my girl loves them though! I can't eat much bananas and papaya at one go cos too filling. Yeah cherries are expensive.. Plus they have seeds in the middle, not syiok, hehe.. Blueberries more syiok..Me ahh? Mangoesteens? Once start cannot stop..
Mangosteens also got seeds wor. Cherries! I'm eating these at home right now! They're not too expensive in Australia this Christmas. hmmm, give me five because i have the same thoughts also.. not that i will actually forgo great food to save the money for cherries, but i do find cherries very expensive here that i am not willing to buy, hahahaha!! Ya last time I went to Canada I ate a big box of cherries. Strawberries are more expensive than cherries. Hahha...that's my fav fruit too. I also don't buy often due to the expensive price. Ooh this is my fav too! Will eat slowly to stretch out the pleasure haha. I do like blueberries too but one punnet finishes off too fast. Blueberries are so much smaller so more expensive too. I saw the strawberries too but the strawberries are more expensive. 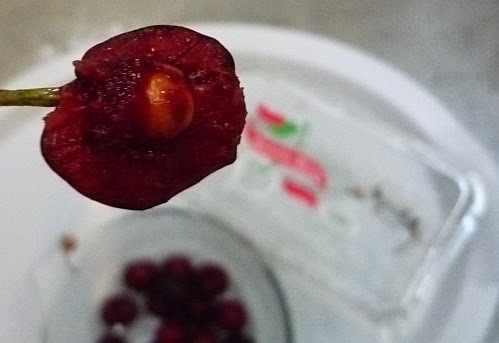 Cherries on top of cakes, ic and drinks are processed and the taste are nothing as nice as fresh ones. Hmm. I prefer dragon fruits and kiwis. Hehe. I dont fancy cherries too. I can eat a big purple dragon fruit at one go. Sweet langsats and mangosteens my all time favourites. Blessed Christmas and Happy New Year to you and loved ones. Thank you for the wishes. Same to you too. I think 1 small diamond can buy many cartons of cherries. Did you buy many boxes back like how you brought back the mangoes?